*1 originally, "when will you grow up to be a man, But the girls I knew at school…"
*2 originally, "they put you on the pill"
*3 originally, "I’m just looking for another girl"
*4 Note: This section was not in Billy’s original song – those verses were written specially at Kirsty’s request since she thought the song was too short as it stood to release as a single. Note that on the original version, and on the BBC session from 1995, Kirsty appears to sing ‘jeans’, and this was published in Smash Hits as the correct lyric. On the BBC session from 1991 with Billy Bragg she clearly sings ‘dreams’. More thoughts originally published in the 1998 book ‘Still Suitable for Miners (the Official Biography)’ by Andrew Collins (Virgin Books ISBN 0-7535-0232-1: “written after seeing two satellites flying alongside each other in the clear Northants sky, the central conceit of the song lies in the claim that the singer doesn’t want to change the world, merely get a shag. It is not hard to hear the irony. Billy is desperate for some romantic inspiration, but the two shooting stars in his song turn out to be satellites. “Is it wrong to wish on space hardware?” he asks. No, seems to be the adaptable answer. Here is a poet trapped in a modern world, so besotted with a girl he does not yet know, he is prepared to cast all broader ideals aside in favour of domestic utopia. 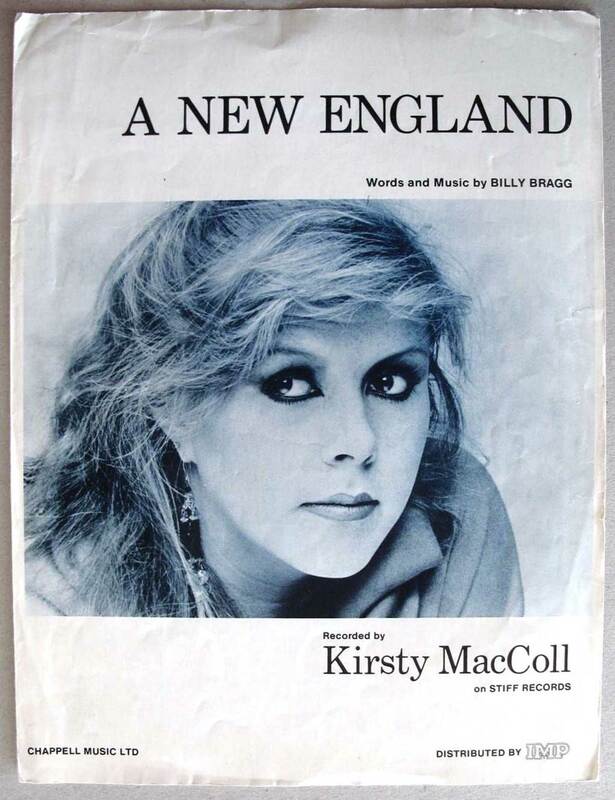 When Kirsty MacColl recorded ‘A New England’ in 1985 and took it into the Top Ten, the paradox of the chorus was rinsed out by a pop arrangement and a sweet voice, but the way Billy plays it, with the lone Duane Eddy guitar and that plaintive quality to the vocal, says it all. 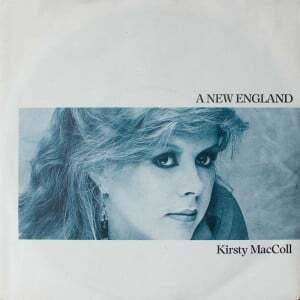 ‘A New England’ appeared on a Rhino Records 1992 compilation called ‘Stiff Box’ which fills up 4 discs with the best of the Stiff recordings (including Tracey Ullman’s ‘You broke my heart in 17 Places’), ‘A Hard Night’s Day’ (A History of Stiff Records) and also ‘Stiff, Stiffer, Stiffest: A Stiff Records Collection’ and most recently ‘Born Stiff’, a Salvo release. The track also appears on the compilation album ‘Diving for Pearls’ which also features Paul Quinn, Stone Roses, Mari Wilson, Sugarcubes& Department S. ‘Sound of the Suburbs’ (Crimson 1998 with Lou Reed, XTC, The Jam, Bow Wow Wow). It featured on ‘Hits Album 2’ (1985), and on ‘Now That’s What I Call Music 1985’ (Queen, Kate Bush, Go West, Feargal Sharkey). It has also turned up on assorted 80s nostalgia trips: double CD set ‘Alternative Eighties’, ‘Hardest Hits Volume 1’ (1991, SPG Music SPG 002) along with acts such as The Puppets, Scary Thieves, Jon Saint James, and The Mood, ‘Into the Eighties’ (1995) and on a Union Square set, ‘Essential 80s’ (2002) – both also include Tracey’s ‘They don’t know’, ‘Alternative 80’s’ (Sony 2002), a Music Club collection called ‘Back to the Eighties’‘, Best of the Eighties Volume II’, as well as a 6 cd box called ‘Best of the Eighties’, ‘Greatest Ever 80s’, ‘More 80s’ box set and a nine CD boxed set called ‘20th Century Hits for a New Millenium (170 hits 1950-1999)’, ‘Cult Classics of the 80s’ (XTC, Talk Talk, A Flock of Seagulls, Spandau Ballet), ‘Cool Britannia’ 3 CD Set ("Britain’s best songs from the 60s, 70s and 80s"’), ‘London Legends’ – issued free with the London Standard in 2004 – and ‘Only Fools and Horses – the album’. Latest sightings on a double CD on V2 called ‘Inspired – the World’s Greatest Covers’, and the BBC Radio 2 ‘Playlist’ triple set from 2006. There are loads more clips on YouTube … ! Love Kristy I own 2 CDs I remember she was interviewed on much music here in Toronto on tv still have that on VHS old school ! Wonderful singer songwriter very missed ! Looking for more CDs I have the essential collection and kite my fave lp of hers ! Love xo p s my grandad was from Manchester !